The location and view from our unit was incredible, and the owners were lovely. The bed was very comfy. I would definitively recommend to anyone visiting Paros. Good location, in quite part of busy Naoussa. Everything was OK. Nice view, very good bedroom, small but nice terasse in the morning shade. The apartment was perfect for our family with two kids 8 and 6 years old. Spacious living room with kitchen and big table, nice furniture, small terrace with beautiful view on the bay. The location is the best in Naoussa, I think, very close to the shops and restaurants, port and bus stop. You can take a boat to go to beautiful beaches for 6,5 euro. Every day cleaning. Maria, the owner, is very friendly and helpful. If I come once again to Paros, surely I would stay in Hara Studios. We liked our hosts very much. She was excellent. The view from our apartment was magnificent. Maria is very helpful and the rooms were spotless and clean every day. Extremely well-located for exploring Naoussa, but in a quiet location so there's no noise. Clean and comfortable room that's fairly basic but great value for money, with a small kitchen area for basic cooking. Staff were very friendly and helpful. Also very near the beach. Le rapport qualité prix. La proximité du port et d'une plage bien que l'accés en hauteur donnant la vue était "sportif "mais dans les cyclades s'est souvent le cas. Naussa di Paros e ' piccola ,ma ha un centro molto caratteristico molto vicino ad Hara. Vorrei segnalare i negozi,il porto dei pescatori ed un ristorante italiano " Pastello "dove ho mangiato veramente alla grande. Lock in a great price for Hara Studios and Apartments – rated 8.8 by recent guests! Located 650 feet away from the center of Naousa, Hara Studios and Apartments offers self-catering accommodations with Aegean Sea or garden views. Set on a hillside, it is just 150 feet from Piperi Beach. Hara studios and apartments are traditionally furnished each with a private balcony or patio. They include a kitchenette with dining area and they are equipped with air conditioning and TV. In the private bathroom, you will find a hairdryer. The popular beach of Kolibithres is around 1.2 mi away. Parikia, the capital and port of Paros, is at 6.2 mi. Paros Airport is at 12 mi. Free Wi-Fi is available in all areas. 뀐 Located in the top-rated area in Naousa, this property has an excellent location score of 9.2! When would you like to stay at Hara Studios and Apartments? 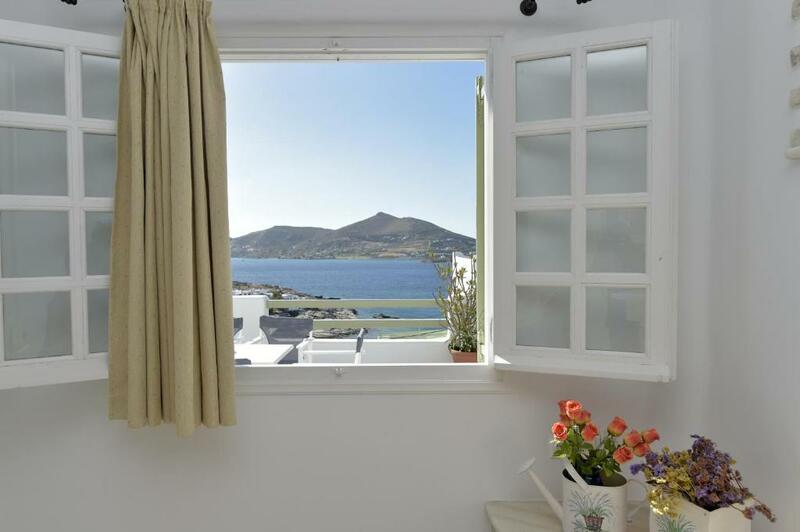 Overlooking the Aegean Sea from its furnished balcony, this air-conditioned studio offers kitchenette and a TV. Please note that this studio is set on the 4th floor and guests need to climb several stairs to reach it. This air-conditioned studio opens out to a grounds -view patio and has a kitchenette and a TV. 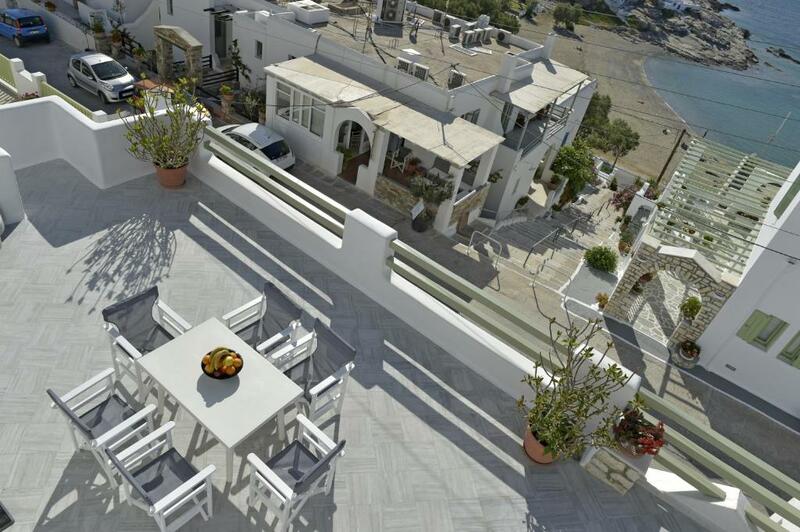 Overlooking the Aegean Sea from its furnished balcony, this air-conditioned apartment has a kitchenette and a TV. Overlooking the Aegean Sea from its private porch, this air-conditioned apartment has a kitchenette and a TV. It is on the upper floor. Very spacious, air-conditioned apartment with 2 bathrooms, full kitchen and dining area. It opens out to a private balcony with Aegean Sea views. This apartment can accommodate up to 2 extra guests upon charge. House Rules Hara Studios and Apartments takes special requests – add in the next step! Hara Studios and Apartments accepts these cards and reserves the right to temporarily hold an amount prior to arrival. The joy of the view made the many steps up to our room on 3rd floor worth the pain for my bad knee... but I wanted to be high up so my choice there are equally lovely rooms on 1st floor. WiFi was hit or miss. The TV in our room didn't seem to be working, which was not a problem for us - and I'm sure staff would have fixed it if we had asked. Noisy upstairs all night on old wooden floor. Bedrooms were average and bathroom in need of upgrade. Good view and balcony amazing. The location is on a hill, so may be for older people it could be a little bit difficult to go up and down. But for our family it was ok. I feel that there should be better selfcatering equipment like at least 4 big plates, a spatula, a breadboard, peeler and grater. Would be nice to have a proper showerhead, not just a handshower.